1. Start by mixing the oats, chia, and cinnamon together in a large bowl. 2. In a separate container, whisk together the maple syrup, almond butter, and almond milk. Pour the wet mixture over the dry and stir together. 3. 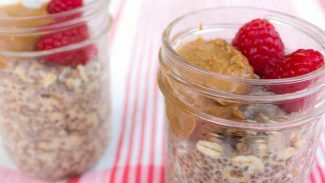 Cover your oats and let them sit overnight in the fridge and get ready for an amazing morning meal! Top with superfoods like hemp, cacao nibs, homemade almond butter, and berries.